TLC Marketing Worldwide was up to the challenge and knew the program needed to fit unobtrusively into the Mexican holiday theme, while also being valuable enough to create excitement and participation. The result was ‘Deadly Days’, a promotion giving customers the chance to win one of 10,000 prizes. 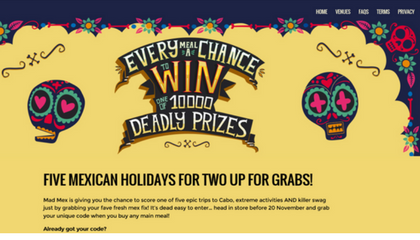 TLC Marketing Worldwide used its knowledge of Mad Mex’ target market – millennials – combined with the brand guidelines and ‘Day of the Dead’ theming, to develop a prize pool that included, festival tickets, extreme sports adventures, movie tickets and Mexican-themed beach towels. 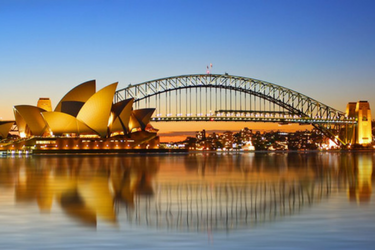 TLC Marketing Worldwide oversaw developing the entire concept, obtaining and delivering the Instant Prize pool, creating and maintaining the redemption website and managing the entire customer service experience. The Mad Mex team developed all creative in-house; activations included a custom menu board, POS shelf wobblers, in-restaurant promotional posters, large outdoor scooters, online content, press coverage and heavily promoted social media content. The ‘Deadly Days’ Campaign was a success, exceeding all three of the original campaign objectives: we achieved an increase in customer count, an increase in the average transaction value, and an increase in the subscriber base. More importantly, customers were engaged on a personal level. Promoted heavily on social media, the campaign evoked social media engagements including numerous friend-tags and a healthy dosage of emoticons. Contact nikki.saunders@tlcmarketing.com to talk about a campaign for you!